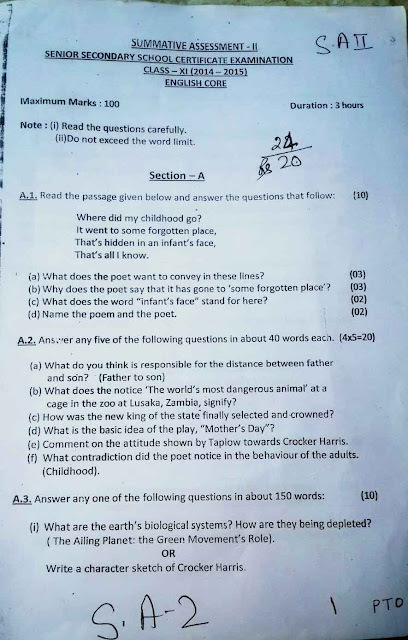 CBSE and NCERT Class Notes and Solution of English from class VI to XII. The focus is mainly on IX,X,XI,XII books. 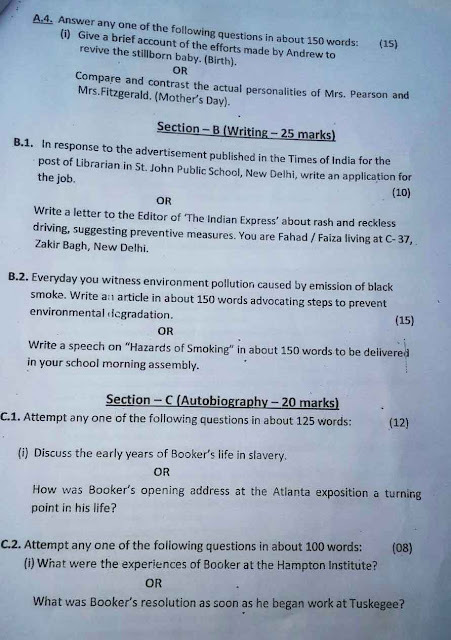 CBSE Sample papers, practice sheets, interactive quizzes and online resources are also available for free and free to download. Up from Slavery tells the life story of Booker T. Washington, from childhood through the height of his career. It is written in the first person, supplemented with excerpts from letters and newspaper editorials about his work. Washington was born as a slave on a plantation in Virginia. He had a burning desire for education and, once freedom came, he taught himself to read. He spent much of his boyhood working in a salt furnace and a coal mine, attending school whenever he could. When he heard of the Hampton Institute - a school open to people of all races where students could work in exchange for board - he became determined to attend. After working for some time in the home of Mrs. Viola Ruffner, he set off for Hampton. His excellent training and work habits paid off, as he was hired as a janitor and allowed to enrol. At Hampton, Washington became acquainted with his lifelong mentor and friend, General Armstrong, to whom he credits the idea of industrial education. He also learned to eat with a tablecloth and a napkin, bathe regularly, brush his teeth, and use sheets. Donors paid his tuition, but he worked hard both during the year and in the summers to pay for his board and necessities such as clothing and books. He learned that the happiest people were those who did the most for others, and also that one of the best things education could do is to teach a man to love labour. After graduation, Washington returned to his hometown of Malden, VA and began teaching in the community. He taught both during the day and at night, and prepared several students (including his brothers) to attend Hampton. He also studied for eight months in Washington, D.C., where he found that students were less self-reliant as they had not learned to help themselves through industrial work. He found that many blacks in the city had become lazy, hoping for an easy life. At the close of his studies, Washington was invited to teach at Hampton. He lived with a group of American Indian men as a "house father," and also took charge of the newly opened night school. When two men wrote to General Armstrong looking for someone to take charge of a new school for coloured people in Tuskegee, Alabama, Washington was recommended and accepted the job. He spent some time traveling around the region to get a sense of people's needs, and found they were extremely great. When the Tuskegee Institute opened, there were just 30 students and one teacher, and the only structures were an old shanty and an abandoned church. Washington, along with Olivia Davidson, a teacher who later became his wife, worked hard to raise funds to purchase an abandoned plantation close to town. They shared a vision to teach far more than books, including proper hygiene, diet, table manners, and the practical knowledge of an industry that would allow students to make a living. With a loan from General Marshall, Treasurer of the Hampton Institute, they purchased the land and had students repair the dilapidated buildings. Students also cleared the land and planted crops, under the leadership of Washington himself. Soon Washington and Davidson began traveling north to fundraise for new buildings. Students dug the foundations and did most of the labour themselves. They also learned to make bricks and furniture, and Washington saw that providing a needed service for the community did a lot to improve race relations. Despite objections from students and their parents, Washington insisted that all students learn an industry and spend sufficient time working at their trade. Enrolment increased, and the school soon opened a boarding department. With more students came the need for more buildings and funds, and Washington increased his fundraising efforts. When traveling north to raise money, Washington also began receiving invitations to give lectures. After speaking at the National Educational Association in Madison, WI, he received an invitation to speak in Atlanta, which opened the door to giving an address at the opening of the Atlanta Cotton states and International Exposition in September 1895. This address was the high point of his career. Speaking in front of an audience of mixed race and origin (north and south), he shared his ideas that southern blacks should remain in the south and primarily work with their hands, and that southern whites should turn to their black neighbours rather than to foreign immigrants to meet their needs. Blacks should not agitate for social equality, but rather earn privileges through hard work and struggle. The speech was extremely well received by the white community, and Washington was soon in high demand as a speaker. Some of his own race were less positive, however, as they felt he had not spoken out strongly enough for black "rights." Washington spoke at a number of other notable events, including the dedication of the Robert Gould Shaw monument in Boston and a peace celebration in Chicago following the close of the Spanish-American war. Tuskegee by that time was able to run itself in his absence, although he was kept informed of its proceedings through daily reports. He was also honoured in a number of public receptions and received an honorary degree from Harvard University. In the spring of 1899, some of Washington's friends in Boston arranged for him and his wife to take a tour of Europe for a few months. It was his first vacation in 19 years. The couple visited Holland, Belgium, France, and England and met a number of important individuals, including the queen of England. Tuskegee grew enormously in the twenty years since its inception. From its start in a broken-down shanty and a hen-house, it had grown to 2300 acres of land, 66 buildings, thirty industrial departments, 1400 students, and 110 officers and instructors, and it was well-respected enough to earn a visit from President McKinley. Washington's mother was the plantation cook. She had three children: Washington, his older brother John, and his younger sister Amanda. Despite the family's poverty, she also adopted an orphan boy, James. Washington comments about how much his mother supported his education. She somehow procured a Webster spelling book for him to learn his alphabet, and she sewed a cap for him in order to fit in with the children at school. Washington greatly respected her for refusing to go into debt to purchase a store-bought cap, instead solving the problem by making one herself. She passed away during one of his summer breaks while he was studying at the Hampton Institute. Washington's stepfather brought the family to West Virginia after Emancipation, where he had procured a cabin and a job in a salt mine. He made Washington and his brother John work in the salt mine as well, even though they were still children. He was far less supportive of his stepson's desire to go to school than Washington's mother, allowing the boy to attend only with the condition that he work many hours before and after classes. Ironically, Washington took his last name from his stepfather's first name (Washington), giving himself this surname when he realized he was supposed to possess two names at school. John was very supportive of his younger brother. As a child, he wore Washington's new, uncomfortable flax shirt for a few days to break it in. When Washington wanted to go to the Hampton Institute to further his education, John helped him as much as he could with whatever money he could spare. He worked in the coalmines to support the family while Washington was studying. After graduating, Washington repaid the favour by preparing John to enter Hampton himself, and by saving money to help pay his expenses. John later became Superintendent of Industries at Tuskegee. Both brothers also helped send their adopted brother James to Hampton, which prepared him to become Tuskegee's postmaster. Viola Ruffner was the wife of General Lewis Ruffner, owner of the salt-furnace and the coalmine where Washington and his brother John worked. Although she had a reputation for being unusually strict with her servants, Washington preferred to enter her service than to continue working at the coalmine. He worked for her at a salary of $5 per month and soon learned how to keep her satisfied. He credits her with teaching him valuable lessons about how to take care of a house. Ruffner was supportive of Washington's education and allowed him to go to school for an hour a day during some of the winter months. It was while living with her that he began to compile his first "library." Mary F. Mackie was the head teacher at Hampton and controlled who would be admitted. Washington impressed her with his diligence while cleaning the recitation room, and she hired him as a janitor along with allowing him to enter the institution. The position was instrumental in allowing Washington to study, as it paid for nearly all of his board. Mackie became a good friend and worked alongside Washington to prepare the school for students' entrance. He respected the way she cleaned windows, dusted rooms, put beds in order, and so on, despite being a member of one of the oldest and most cultured northern families. General Armstrong was the leader of the Hampton Institute and one of Washington's most important mentors. He was a northern white man, but he dedicated his life to helping students of both races in the south. Armstrong was well loved and respected by his students, who, for instance, gladly honoured his request to live in tents during the cold winter in order to make room for more students. He was instrumental in advancing Washington's career: he found a donor to defray the cost of his tuition at Hampton, invited him to return to the school to teach and start a night-school, and recommended him to the founders of the Tuskegee Institute. He helped Washington raise funds as well, donating some of his own money and introducing his former student to potential donors in the North. The two were so close that Armstrong spent several months at the end of his life with Washington at Tuskegee. Smith was Washington's first wife. She came from West Virginia and was a graduate of the Hampton Institute. The two married in 1882 and had one daughter, Portia Washington, who became an accomplished dressmaker, musician, and teacher. Smith passed away in 1884, just two years after marrying Washington. Davidson was Washington's second wife. She was born in Ohio, but moved to the South when she heard of the need for teachers there. Based on Washington's account, she was an extraordinarily generous and selfless woman. While working in Mississippi, for instance, one of her pupils became sick with smallpox. When nobody would nurse him for fear of catching the disease, she closed her school and nursed him herself. Similarly, she offered her services as a yellow-fever nurse in Memphis, despite having no immunity. Davidson was educated at the Hampton Institute and the Massachusetts State Normal School. She came to Tuskegee soon afterwards, bringing many fresh ideas. Along with Washington, she helped to raise funds and to plan the future of the institution. Washington and Davidson married in 1885. They had two children together: Baker Talia Ferro, who later mastered the brick mason’s trade at Tuskegee; and Ernest Davidson Washington, who at the time of the book's publication was studying to be a physician. Davidson passed away in 1889, after four years of marriage and eight years of work for the school. Mention the three phases of the author’s relationship with his grandmother before he left the country to study abroad. The author mentions three phases in his relationship with his grandmother before he went abroad for studies. The Early Childhood: During this phase, he lived with his grandmother in the village and was very intimate with her. The grandmother looked after him and took care of him like parents do. She woke him up, bathed and prepared him for school. Moreover, she used to accompany her to school as it was attached to the temple and she prayed there. The write is very close to her in this phase. In the City: This is the second phase when they both shift to the city as the author's parents get settled there. The author shares a room with his grandmother, but she does not accompany him to school anymore and can't help him in his studies. They saw less of each other in this phase and this proved a turning point in their relationship. The author gets a separate room: In this phase, the author gets a separate room as he joins university and the only common link of their friendship: room, is also broken. The grandmother takes up the wheel spinning, bird feeding, and prayers. She accepts her aloofness with resignation. Mention three reasons why the author’s grandmother was disturbed when he started going to the city school. Firstly she could not help the author with his lessons. Secondly, she did not believe in the things they taught at the English school and was distressed that there was no teaching about God and the scriptures. And finally, she was very disturbed when she heard that her grandson was receiving music lessons. She believed that music had lewd associations and it belonged to harlots and beggars. Mention three ways in which the author’s grandmother spent her days after he grew up. a)Most of the time she remained by the side of spinning wheel. b)She talked less and her lips always moved in reciting prayers and fingers busy telling the beads of the rosary. c)She also loved to spend her time with sparrows, feeding them. The odd way in which the author’s grandmother behaved just before she died. The author’s grandmother behaved in a very odd way just before she died. She did not pray. Instead, she collected the women of the neighbourhood, got an old drum and started to sing. This was very unusual for her and the family had to persuade her to stop. Question: Mention the way in which the sparrows expressed their sorrow when the author’s grandmother died. Thousands of sparrows sat around the grandmother's dead body without any chirruping. All flew away silently when the body was taken away for cremation without eating any of the breadcrumbs offered to them by author's mother. Pouring unto us from the heaven's brink. This poem is an excerpt from a longer poem titled as Endymion written by famous English poet John Keats. In the poem Keats talks about the concept of beauty, its immortality and how it is embedded in nature. The opening lines set the mood of the poem by firmly stating that "A thing of beauty is joy forever." He rightly states that the objects of beauty are lying all around us- the sun, the moon, trees, musk rose and daffodils. In his definition of beauty he includes things that are produced by human beings like art, poetry and mythological stories. He opines that the world is suffering because it has gone away from Nature. If we return to nature and appreciate the beauty around us, may be there is less violence and the world is a better place to live in. How is a thing of beauty a joy for ever? A thing of beauty is a source of constant joy. Its beauty goes on increasing and it will never pass into nothingness. What kind of sleep does it provide ? It provides a sound sleep, full of sweet dreams, health and peaceful breathing. What are we doing every day ? We are weaving a flowery wreath to bind us to the beauties of this earth. Describe bad and evil things that we possess in us. We suffer from disappointment, lack of noble qualities and unhealthy and evil ways. What removes the pall from our dark spirits and how ? Some beautiful shape or a thing of beauty removes the pall of sadness from our " hearts or spirits. What sprouts a shady boon for sheep and how ? Trees old and young sprout to make a green covering. It becomes a shelter for simple sheep and proves a blessing for them. Describe the role of daffodils and clear rills in enriching the environment. Daffodils bloom among the green surroundings. The small streams (rills) with clear water make a cooling shelter for themselves against the hot season. What is lovelier than all lovely tales we have heard or read ? The beauty of daffodils, rills and musk-roses is more enchanting than all lovely sto­ries that we have heard or read. What is the source of 'the endless fountain of immortal drink' ? An endless fountain of nectar that makes us immortal pours into us the heavenly bliss of nature. What is the effect of that 'immortal drink' on us ? That immortal drink that nature's endless fountain pours into our hearts is a source of immense joy for us. List the things of beauty mentioned in the poem. Every little or big thing of nature is a thing of beauty and a source of pleasure. The sun, the moon, trees old and young and daffodil flowers are all things of beauty. So are small streams with clear water, mass of ferns and the blooming musk-roses. They are constant sources of joy and pleasure. List the things that cause suffering and pain. There are many things that cause human suffering and pain. The biggest source of suffering is our malice and disappointment. The lack of noble qualities is another. Our unhealthy and evil ways also give birth to so many troubles and sufferings. They depress our spirits. They are like a pall of sadness over our lives. John Keats is a sensuous poet. He is firmly attached to the endless beauty of the earth. The link of man with nature is constant and unbroken. The things of beauty are like wreaths of beautiful flowers. We seem to wreathe a flowery band that keeps us attached to the beauties of this earth. So many things bring troubles and sufferings. They depress our spirits. But 'some shape of beauty' brings love and happiness in spite of such unpleasant things. A thing of beauty removes away the pall of sadness and sufferings from our lives. It makes human beings love. The mighty dead were the people who were powerful and dominating in their own times. Their achievements made them 'mighty' and great. Their works dazzle our eyes. We imagine that such mighty dead forefathers will attain more grandeur at the doomsday. They will be rewarded. Hence grandeur is associated with the 'mighty dead'. Do we experience things of beauty only for short moments or do they make a lasting impression on us ? (Imp.). John Keats makes it clear in the very first line of this excerpt that 'a thing of beauty is a joy forever'. It is a constant source of joy. Nor does its beauty decrease. Its loveliness goes on increasing every moment. Its value remains undiminished. It never passes into nothingness. It always removes the pall of sadness that covers our dark spirits. What image does the poet use to describe the beautiful bounty of the earth ? John Keats uses various images to describe the beautiful bounty of the earth. The bounty of the earth is like an endless fountain. This endless fountain of immortal drink constantly pours from the heaven into our hearts. John Keats, a great Romantic poet, considers that a thing of beauty is a joy forever. It is a constant source of happiness and pleasure. Its loveliness increases every moment. A thing of beauty is never devalued. It never passes into nothingness. How does a thing of beauty keep a bower quiet for us? Keats is rich in sensuous imagery. Nature provides us with things of rare beauty. A pleasant place in the shade under a tree provides us a quiet bower. Similarly, a thing of beauty transports us to peace and security. We enjoy a sleep full of dreams, health and peace. Like all Romantic poets, Keats stresses the unbreakable bond of man with nature and the earth. The beauties of the earth fascinate man. Every object of nature is a source of beauty and happiness. Every day we are weaving a wreath through these beautiful things. This flowery band binds us with the earth. What are the things that give sufferings and sadness to man? Man, himself, is the root cause of his woes. We suffer from malice and distress. Unfortunately, we lack human qualities and it makes us inhuman. Our life becomes gloomy. We cultivate unhealthy and evil ways. All such things bring misery and sufferings to men. In spite of all troubles and sufferings human beings love life. The beauties and blessings of nature move away the 'pall' from our 'dark spirits'. Such things of beauty are joys forever. Man makes his life miserable by his own nature and actions. He faces miseries and pains. Amid these miseries and sufferings, a thing of beauty provides a hope to man. Some shape of beauty works wonders. It removes the pall of despondence and sadness from our 'dark spirits'. Name the things of nature that are constant sources of beauty. The beauties of nature are endless. The sun, the moon, trees old and young, beautiful daffodil flowers, green surroundings are some of such beautiful things. Similarly, small streams of clear water, green ferns and thickets of the forest and musk-roses are some other things of beauty. All such things of beauty are a constant source of joy for us. The 'mighty dead' were people of great power, authority and grandeur. They were wealthy, brave and awesome people. They are dead in their grave but still reflect that gran­deur and glory. What is the source of the 'endless fountain' and what is its effect ? The beauties of nature know no limits. Nature is an eternal source of joy to mankind. A fountain of eternal joy and immortality pours into the heart and soul of man. It flows and pours right from the heaven's brink. What is the message that John Keats wants to give through 'A thing of Beauty' ? The very first line of the poem conveys the message of the poet. John Keats was a worshipper of beauty. A thing of beauty is a joy forever. Beauty never fades. Nor is it devalued. It never passes into nothingness. A thing of beauty removes away the pall of sadness and sorrows and gives us joy and pleasure. This chapter has been taken from "My Years with Boss" written by Asokamitran. Asokamitran worked in Gemini Studios, a very famous film studio of its time. His job in the studio was to cut newspaper clippings on various topics and maintain a file of the same. Through this write up Asokamitran brings up a lot of topics pertaining to film industry in particular and India in general, and provides the reader a glimpse of Independent India in its infancy. He first takes up the make up department, and makes fun of the trouble that the artists took to look "ugly" and the pain they underwent under the glare of the big light bulbs. In fact the term 'pancakes' refers to the brandname of make-up material which was excessively by the aartists of the Gemini Studio. He talks of the office boy who is actually a grown up man of forty years who once aspired to be a director but blames Subbu(the number 2 in the studio) for his current state of affairs. Thus Asokamitran highlights the plight of thousands of aspring actors, directors and producers who end in umpteen number oblivious jobs in any such studio. Kothamangelam Subbu, the number two in Gemini studio is a story in himself. He is very talented, a poet, novelist, actor and film maker. He is an all rounder and very loyal to boss. Another character that comes into focus at Gemini studios is the legal advisor, who wears western clothes among the rest of the Khadi clad gentry. Asokamitran also tell about the manner in which the legal advisor ruins the career of a talented actress unwittingly. · Pancake was the brand name of a make-up material. The Gemini studios bought a lot of it. · Make-up men used it to turn decent looking players into hideous looking monsters. · Infact, it was because most of the shooting of a film was done on the sets. · The set and studio lights required that every pore of the players’ faces was closed. · A strict hierarchy was maintained in the make-up department to make the players look ugly. Ø It was the office boy’s job to make the crowd players ugly. · He believed that he had a great talent and hoped to become a star actor, director, screen writer or lyric writer. · But he was frustrated à He blamed his disgrace on Kothaman. · Galam Subbu àwho was considered No. 2 at the Gemini Studios. · The make-up department was in the upstairs of a building that was said to have been Robert Clive’s stables. · The make-up room looked like a hair-cutting salon because it had large mirrors and lights. · The lights gave out intense heat àThe person who underwent make-up had a miserable experience of being scorched as if in hell. · The nature of the author’s job appeared to be insignificant. · Everybody would walk into his cubicle and want to give him some work to do. · The office boy would come in to recite his poems. He wished to impress the author by his talent and how it was going to waste on account of Subbu. · The office boy was frustrated . Probably he was jealous of Subbu’s nature. · Subbu was very close to the boss. He had no better qualification than the boy. · But he had worked hard to reach this position. · Subbu had a more affluent exposure because he eas a Brahmin. He would remain cheerful in spite of failures. · He had talents which he used for the advantage of his Boss. · Whenever the Boss had any difficulty in presenting a scene in a film, Subbu would suggest a number of practical ideas. · Subbu was a good poet too. He could write poems of a high order. · But he deliberately suppressed his talent to write for the masses. · He had created life-like characters too. · Subbu was an excellent actor. But he never aspired for lead roles. · But whatever minor roles he played, he acted better than the main players. · Subbu loved all. Several friends and relatives stayed with him for long periods. · But the office boy hated him à Perphaps Subbu appeared to be a sycophant. · Though Subbu was always seen with the Boss, he was a member of the story department. · Besides writers and poets in the story department there was a lawyer too. Ø Officially he was known as a legal advisor, but people called him by an opposite name. · Once the legal advisor unwittingly ruined the career of a of a talented actress. · An actress, who was not seasoned in worldly wisdom, lost her temper on the sets. She spoke angrily against the producer. · The legal advisor switched on the recording equipment, when she paused, he played back the record. · The action was dumbfounded to hear her own voice. Though she had not said anything offensive, she never appeared on the stage again. · The legal advisor wore trousers, shirt and tie. Sometimes he wore a coat too. · He appeared odd among the khadi clad poets and writers. · The poets and worshipped Gandhiji though they had no affiliation to his ideas. · But they were averse to communism. · They had a notion that communist loved nobody. He was an anarchic. · The Moral Re-Armament Army was a sort of anti-communism movement. It visited Gemini Studios in 1952. · They were about 200 people belonging to atleast 20 nationalities. · They presented two plays ‘Jotham Valley’ and the ‘Forgotten Factor’ in a most professional manner. · The Gemini family of six hundred and the citizens of Madras were greatly impressed by their plays. · Their message was simple but the sets and costumes were excellent. · For many years the Tamil drama imitated àThe sunrise and sunset scenes presented by the MRA. · The scenes were presented on a base stage with white background and a tune played on the flute. · But the MRA did not influence the outlook of the Gemini Bosses. · A few months later Gemini Studios received another guest. · It was an Englishman. Nobody knew who he was. · Some said he was a poet. Some believed he was an editor because the topmen of The Hindi were taking the initiative. · But he was not the editor of any of the newspaper the staff of Gemini Studios had heard of . · The Englishman was welcomed by the Boss, Mr. Vason. · He read out a long speech talking of freedom and democracy. · Then the Englishman spoke àwho could not be expected to have any interest in English poetry. · The visit of the Englishman remained a mystery. · The author saw a noticed in the Hindu. · The Encounter, a British periodical, was organizing a short story contest. The author had never heard the name of the periodical. · He wanted to send on entry à but wanted to have information before. · He visited the British Council library. These he found copies of the Encounter. · He leaned that its editor was Stephen Spender àwho visited the Gemini Studios. · One day he saw a pile of low priced paperback editions of ‘The God that Failed’, He bought a copy. · It contained six different essays by six different writers. · They described the writers ‘Journeys into communism and the disillusioned return. · The whole mystery of Spender’s visit was cleared. · Mr. Vasex was not interested in his poetry but in his views on Communism. 1. What does the writer mean by ‘the fiery misery’ of those subjected to make-up’? The incandescent bulbs used in the make-up room produced lot of heat, and caused a lot of discomfort to the artists while in the make-up room. Every actor has to undergo some sort of make-up before shooting and had to suffer the heat of the bulbs in the room. This misery has been referred to as fiery in the lesson. 2. What is the example of national integration that the author refers to? The make-up division of the Gemini Studios was an example of national integration. According to the author, this is so because people from different regions and religious groups worked together in the same department. The department was headed by a Bengali who was succeeded by a Maharashtrian. The other helpers included a Dharwar Kannadiga, an Andhra, a Madras Indian Christian, an Anglo-Burmese and the local Tamils. 3. What work did the 'office boy' do in the Gemini Studios? Why did he join the studios? Why was he disappointed? The office boy applies makeup on the lesser know actors who usually played the role crowd. He would mix various potions and would apply it to the crowd playing actors in the most unprofessional way. He had joined the studios hoping that he would become a star actor someday or hold a prominent position in the film industry. But he failed and remained a mere 'office boy' and this left him perpetually disappointed. 4. Why was the office boy frustrated? Who did he show his anger on? The office boy was frustrated because despite getting a good opening, he remained only an office boy. He had had a good formal education and would write poetry also. But his great literary talent was being allowed to go waste. He showed his anger on Kothamangalam Subbu, the No. 2 at Gemini Studios. 5. Who was the Boss of Gemini Studios? Mr. S.S Vasan was the Boss of Gemini Studios. 6. What caused the lack of communication between the Englishman and the people at Gemini Studios? Most of the 600 odd people at Gemini Studios were Tamil speakers. The Englishman was addressing them in his own language-English. He had a peculiar accent. Hence, there was a lack of communication between the Englishman and the people at who could not follow what he was saying. 6. Why is the Englishman’s visit referred to as unexplained mystery? The Englishman’s visit to the Gemini Studios is referred to as an unexplained mystery because no one could decipher his identity, whether he was a poet or an editor. Besides, when he spoke no one at the studio understood what he intended to say as his accent was beyond their comprehension. 7. Who was the English visitor to the studios? The English visitor to the Gemini Studios was Stephen Spender. He was the editor of The Encounter, a British Periodical, and a famous English poet, essayist and novelist of the twentieth century. 8. How did the author discover who the English visitor to the studios was? 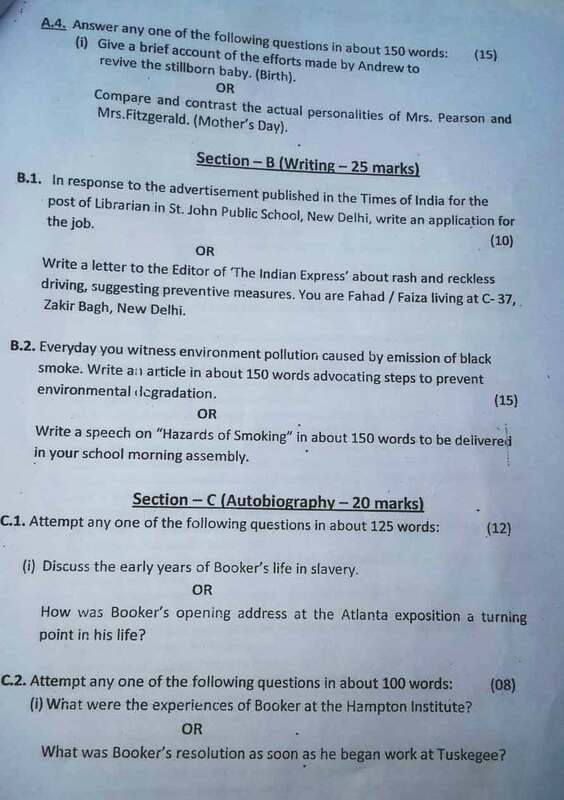 Before investing money in participating in a short story contest organised by an English periodical The Encounter, the author did a research on the magazine. He went to the British Council Library where, while going through an issue of that periodical, he discovered that its editor was Stephen Spender, the poet that had once visited the studio. 9. What does ‘The God that Failed’ refer to? 'The God That Failed' was a compilation of six essays written by six eminent writers, namely, Andre Gide, Richard Wright, Ignazio Silone, Arthur Koestler, Louis Fischer and Stephen Spender. In each of the essays, the respective writers described “their journeys into Communism and their disillusioned return”. The author has used gentle humour to point out human foibles. Pick out instances of this to show how this serves to make the piece interesting. The instances of humour, used by the author, mark the eccentricities and idiosyncrasies without making any direct and rude comment on anybody. For instance, the author portrays the make-up artists and the usage of the pancakes in an interesting way. Even the caricature of Subbu is hilarious. The way he tries to help his principal by offering quick solutions to his problems is quite amusing. The episode of the legal adviser that inadvertently causes the end of an actress’s career is yet another example. The frustration of the office boy, the superficial praising of Gandhi, hatred of Communism and the ‘mystery’ surrounding Stephen Spender are some of the instances where the author has incorporated gentle humour. Why was Kothamangalam Subbu considered No. 2 in Gemini Studios? Kothamangalam Subbu succeeded in securing the place closest to The Boss by means of flattery. He was not brilliant but a rather cheerful person and exceedingly loyal to The Boss. He offered solutions whenever The Boss was in a fix. Thus, the other employees considered him No.2 in Gemini Studios. How does the author describe the incongruity of an English poet addressing the audience at Gemini Studios? The English poet was addressing the Tamil audience at Gemini Studios in English with a typical provincial accent. He was talking about the thrills and travails of an English poet to a dazed and silent audience. This was the incongruity because his audience could not understand him at all. What do you understand about the author’s literary inclinations from the account? The writer was a prose-writer. He wanted to send a short story for the short story contest organised by a British periodical by the name 'The Encounter'. Discuss in small groups taking off from points in the text. 1.Film-production today has come a long way from the early days of the Gemini Studios. Film production is more technical nowadays. While earlier only five per cent of the shooting was done outdoors, nowadays outdoor shooting is no more limited to such a negligible percentage. The cameras and other equipments are more advanced allowing for more varied and accurate presentation. The quality of make-up has improved many folds from the days of the Gemini Studios where only pancake was used. The people involved in various departments are experts in their specialised work, be it the director, producer, scriptwriter, lyricist or the actors. The overall quality of the films is more striking and lively. In India poetry and films are intricately linked. The people at Gemini Studios, all claimed to have the talents of a poet. The main reason behind it was their monotonous and leisurely life at the studios. However, these people were not knowledgeable or educated enough to be poets. Unlike poetry, films can be enjoyed by people with little resources who cannot afford to cultivate taste for poetry and literature. The story is interspersed with instances dipped in subtle humour. The humorous instances, however, make interesting and relevant comments on the behaviour of general people. A humorous story has more readers, a humorous film more viewers. This is because they provide entertainment and a respite from the tedious existence. Criticism by means of humour is more effective, hence writers and film-makers often use humorous elements in their works and make sarcastic comments and criticism.